Are you taking full advantage of your retirement benefits? How the three components of FERS — Social Security, the FERS Basic Benefit and the Thrift Savings Plan (TSP) — work. What to consider when choosing funds in your TSP. 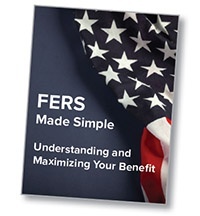 How to leverage the benefits of FERS to extract the maximum benefit to you personally. How the Social Security Supplemental Benefit applies to you and your retirement plans. How to use your FERS benefits to help accumulate enough money to cover your retirement needs. Submit the form to the right to get your copy today!